The Egyptian state was formed prior to the existence of verifiable historical records. Conventional dates for its formation are based on the relative ordering of artefacts. This approach is no longer considered sufficient for cogent historical analysis. Here, we produce an absolute chronology for Early Egypt by combining radiocarbon and archaeological evidence within a Bayesian paradigm. 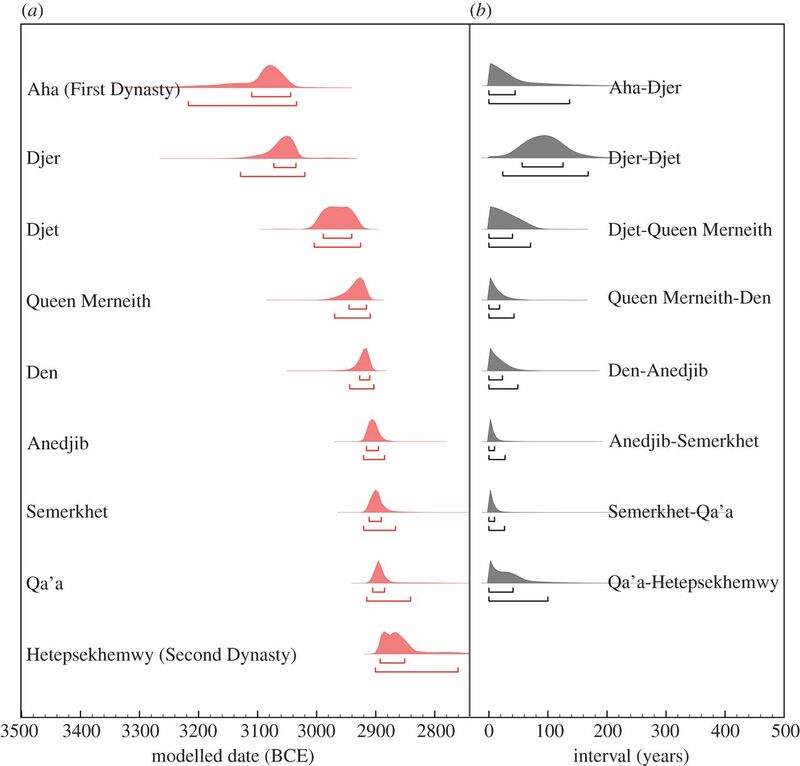 Our data cover the full trajectory of Egyptian state formation and indicate that the process occurred more rapidly than previously thought. 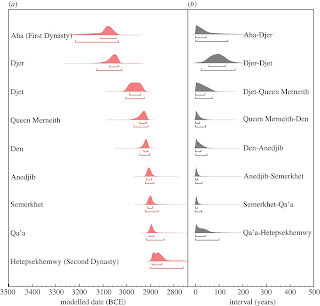 We provide a timeline for the First Dynasty of Egypt of generational-scale resolution that concurs with prevailing archaeological analysis and produce a chronometric date for the foundation of Egypt that distinguishes between historical estimates. A very interesting article. 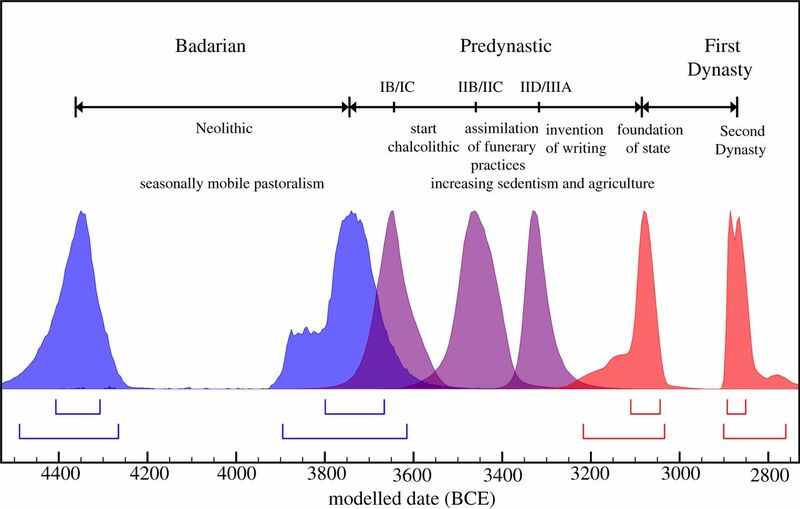 It isn't much more rapid (800 years instead of 1,000). The contrast with Mesopotamia where it took millenia slightly earlier is very interesting though. Humans are not very good at inventing things unless they know it's possible - then they're good; although Egypt may not have copied Mesopotamia just knowing through occasional contact what had happened there will have allowed the Egyptians to achieve things quicker. The new dates slot into the timeline published in "Genesis Of Genesis" (2012). As posted on the FaceBook page for that book: " filled in and explained the time between the Birth of METHUSELAH and that of his son LAMECH. Readers of Genesis of Genesis (or the Bible) immediately recognize that SEVEN is important -- the seven after creation of Egypt, or our key "Enoch", in conjunction with Edom/Aha as "Creation" -- is obviously NOT a coincidence." What does the Y axis on the graphs represent? It is not labeled. Even Lipton tee can be bad for you drink too much of it. Mark Moore - the vertical arrangement is just sequence of early rulers, not a numerical value. The team have done similar work for later periods of Egyptian history - I attended a seminar at Oxford on their Middle and New Kingdom work where dates are signalled by a variety of other clues and so there is more external validation. I was not aware before this that they had moved to earlier periods as well.